Mauritius is a beautiful island nation situated in the southeast coast of Africa in the Indian Ocean. Mauritius with its elegant white beaches and lush greenery with a wide choice of mouth-watering cuisine is the ideal place to be on your honeymoon. So book a Mauritius tour package and capture the beauty of Mauritius. Port Louis is the capital city of Mauritius. It is mainly known for its architecture. Museums are the main attraction of this island. The Blue-Penny Museum is dedicated to the history of the island’s maritime and colonial history, along with its culture. 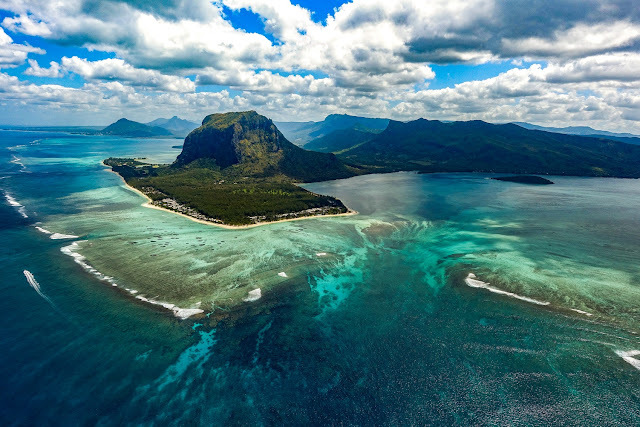 The Natural History Museum exhibits some of the impressive fauna of Mauritius focusing on marine species and the famous Mauritian bird. Here you can explore the Port Louis Theater. It is a very amazing spot to visit in Mauritius for the awesome cultures and traditions. The magnificent Chamarel waterfall located at a height of 100 meters, voted as the best photography scene of the island nation. A couple can choose this romantic destination and shift to the shallow pool of the Chamarel falls and taking a personal swim together with your lover surrounded by greenery of the rainforest. You will get some everlasting lifetime memories. It's an ideal activity for the nature-loving person, the tour of the Pamplemousses Botanical Garden is a relaxing experience for mind and soul-enriching encounter with nature. The dense greenery creates an aura of relaxation and rejuvenation. Fill your lungs with the fresh and purified air and get your body energized and replenished. Blue Bay is the most popular place to visit in Mauritius for sightseer. 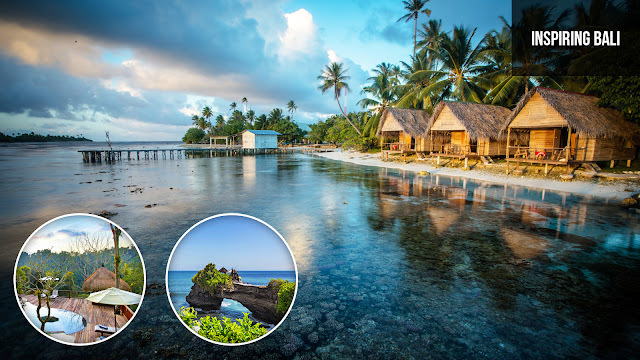 With its spectacular beaches with blue and clear waters, it is certainly a place where you want to spend a lot of time with your lover, family, and children. It is located in the southeast part of the island, also it is near the airport and a variety of hotels which are within a walking distance making it very suitable. No better way to enjoy the beauty of the oceans other than scuba diving, here you can witness the magnificent species of flora and fauna. Mauritius has elegant white beaches surrounded by lush greenery rainforests. is the ideal place to enjoy the romantic sunset on your honeymoon. 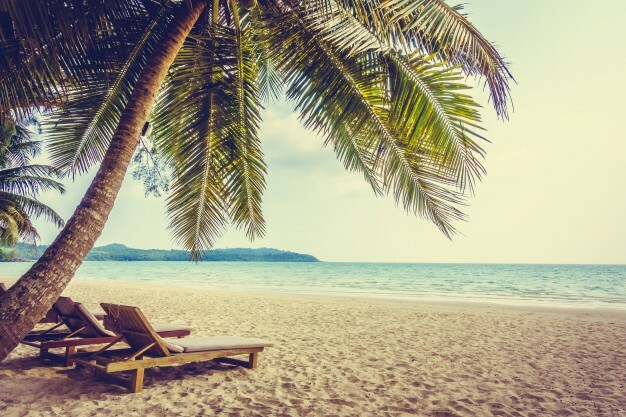 The Riambel Beach is a white sand long beach stretches within close accessibility to the underwater coral reefs also it creates a shallow bay like areas which are perfect for swimming. 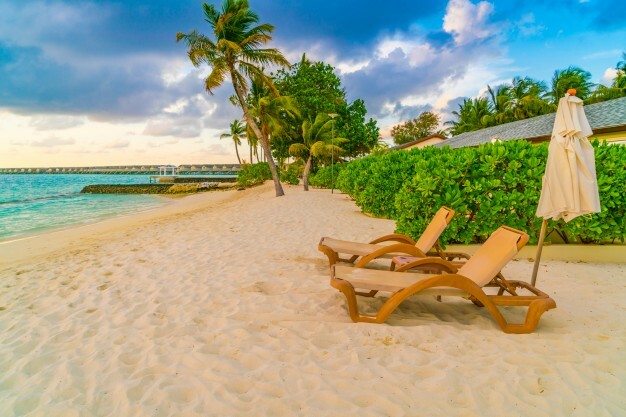 Chose from any Mauritius honeymoon package and explore the place where you can experience your dream of walking into the sunset with your partner. 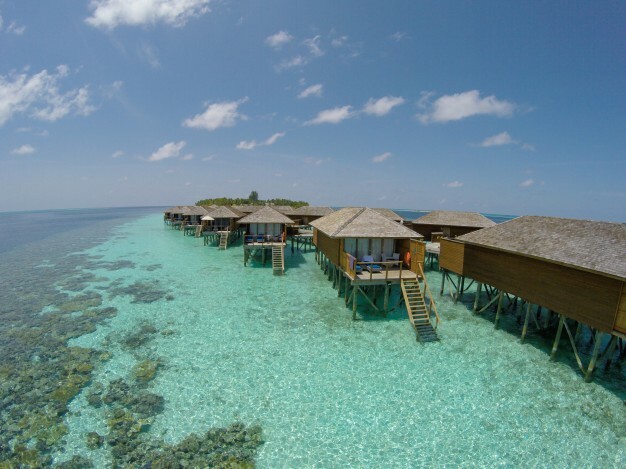 The beach is still very much unexplored and calm leaving adequate room for privacy of the honeymoon seeker couple. Life is going bit slower than your capability and expectations. Don't worry! Firstly, try to wipe out the shadow of negative and stressful thoughts which diminishes the visibility of your goal. Things will be perfectly manage in near future may be tomorrow is your day or the day after tomorrow- or the next week. You will soon find yourself after such initial steps of struggle, frustration or ignorance. Never lose your hope and don't stop back kicking. 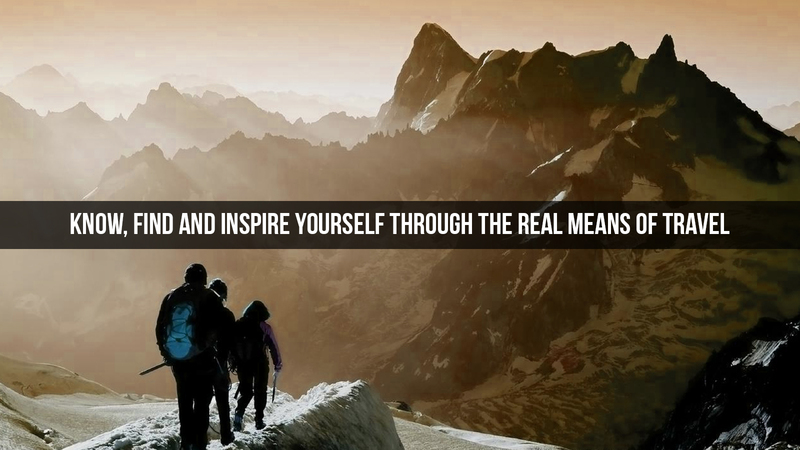 These experiences help to set a strong attitude towards life and finally your day or your moment will come. For this first big rush of success never miss your present. Nature and its ultimate sources are like a big example for our continuous motivation. Like, a practice on surfboard is not too easy during the initial stage, you have to do a lot of efforts even to stand and finally the day comes when you enjoy your speed against fast moving sea waves with a good balance. Try to learn patience and relaxed attitude towards life, especially concentrate on core areas. The time will definitely knock your door. You have to do learn the importance of your own time and live in present moments. Firstly, move out to spend your time with breathtaking nature and its stunning delights, then you will quickly learn about to manage the things in a perfect manner. 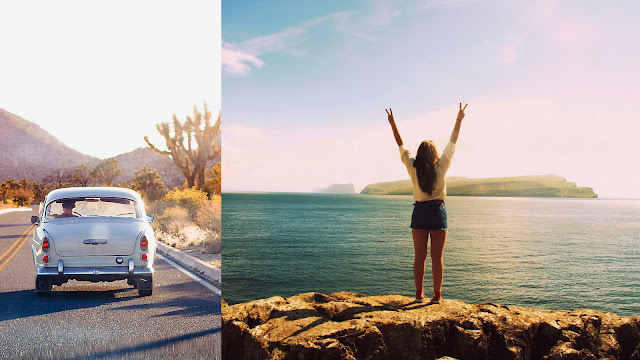 Simply, traveling has direct relation with life with its novelty, a change and unknown experiences. Any kind of challenge gives you inner growth and pure happiness. It is a single situation which provides you a smile again and again even after challenging efforts. It is a trick to get back and know yourself after helpless, fear or frustration like situation. 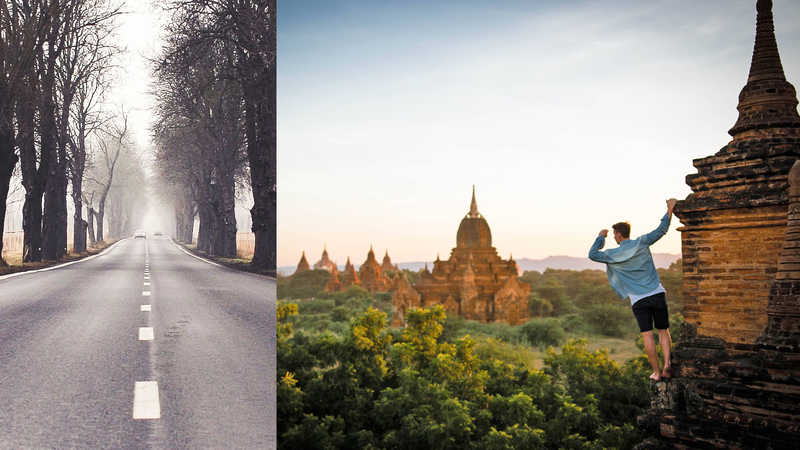 Traveling has all the powers to give the confidence, inspirations and lots of experiences. Now, at this stage you will capable to take your right decision. For such kind of self-examination, we have a list of inspirational destinations which helps to relax and figure out your actual path. 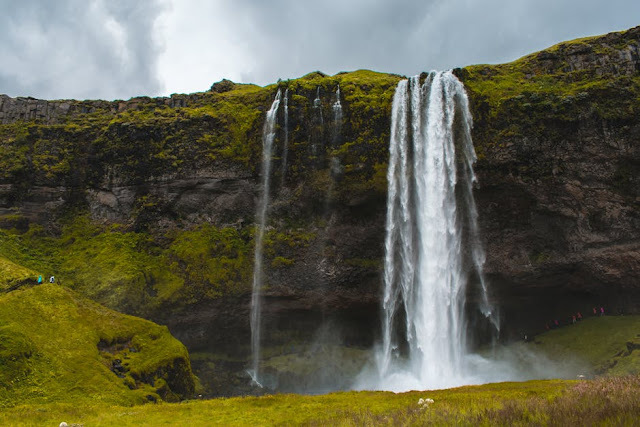 Want to experience a quiet and calm nature away from everything, then Iceland is a perfect island to distress you. It is an immediate route of happiness for your internal fulfillment. Iceland is a beautiful place for solitude seekers, especially Snaefellsnes peninsula- a magical site in the west of Iceland. Cover the breathtaking beauty of golden and pink beaches without any single disturbance from the outer world. Meet with the several interesting stories related to Snaefellsnes glacier and feel the power of place as a core energy center. 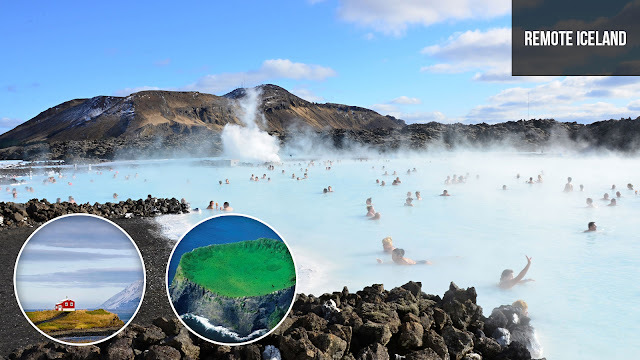 You can enjoy an exciting nature with lovable adventures during your hike in geothermal or relaxing hot pots. Also enjoy long walks by the sea, hike up a volcano or long day ride on typical Icelandic horses. 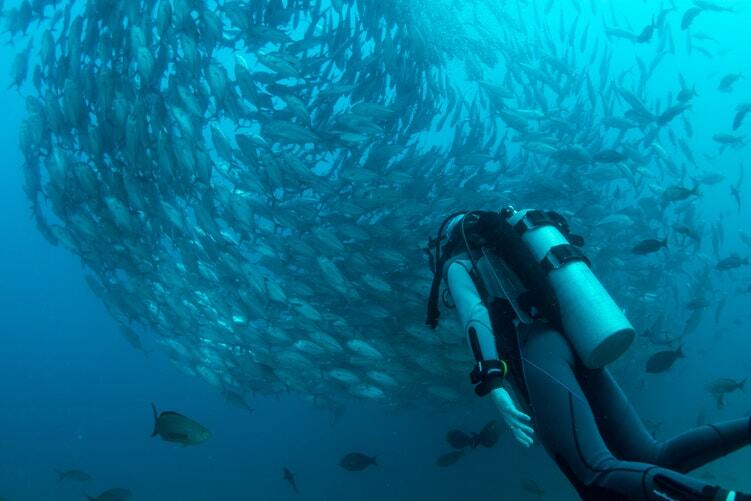 Indonesian islands have a grasping beauty which surely attracts your attention at every single point. From the collection of such attractive gems, Bali is one of the major tourist attractions with its unique specialities. You can explore this incredible island in your own way from Kuta, Ubud, Canggu, Nusa Dua and other attractive attractions. Ubud is famous for spiritual center, yoga centers, healing treatments, greenery, rice terraces and vegetarian restaurants. Kuta heartily welcomes a tourist with its shopping areas, nightlife, handicrafts and adventure sports. Similarly, Canggu is good for cool surfers, beer tasting, beach walk and beautiful sunset. Just arrange a beautiful open villa for your stay and capture its green surroundings. Within the company of unbelievable nice locals, you can get a chance to know about the culture and local traditions of the place. This Asian attraction has a temple like divine setup for your inner bliss, peace and internal satisfaction. Are you expecting to find a joyful and fun-loving person from your own, then live the life of Italy to get the same attitude towards your life. It is a perfect way to encourage your inner self and forget all the worries and issues related to life. You will get all the resources to spend an enjoyable life. You can start your day from any small town and its comfortable apartment. After enjoying your bed & breakfast, take a map and headed towards the local specialities of the place. 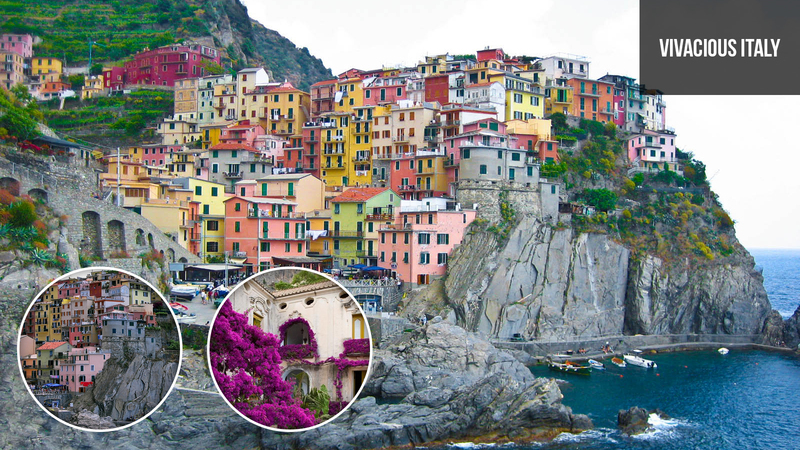 Try to capture the beautiful landscapes of Italy and cherish your evening with a wine toast. You have endless opportunities to spend your finest moments while sitting in your patio, or stroll the local vineyards and olive groves. Preserve endless memories while your chit-chat with locals at a cafe or during sunbath at popular beaches. With this easy touch and fine bonding with people, you can easily forget the bored or lonely like words from your mind. Sometimes, there are several beautiful places in front of our eyes or at our doorstep, but we are not easy to select the perfect one. Even the small steps have the power to put the things in the right place like a week-long stay in a beautiful small hut within a perfect setup of Alpine mountains. 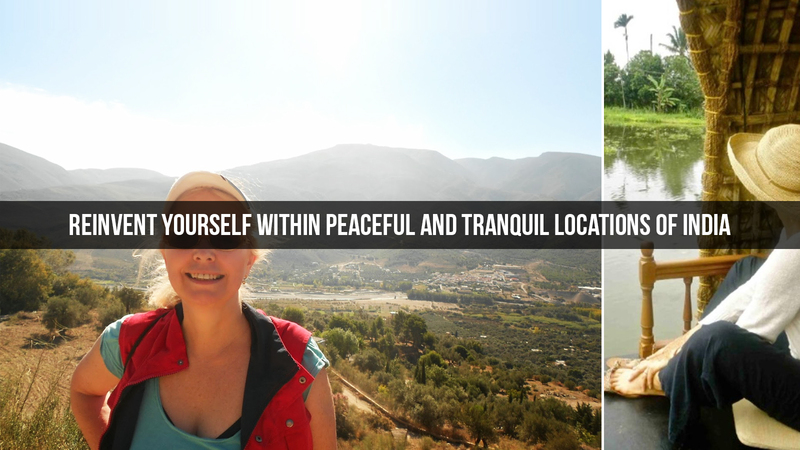 Spend your days in such kind of remote locations where you can internally communicate with peaceful nature. You will get the time to put the things on the right track. As a great combination of active and stress free life, simply enjoy a nice ice walk, hiking, reading, outside picnic, cold ice streams and relaxed sleeping there. Try to find yourself in such stunning views of Alps valley. Truly, it's a bet you will forget all your home comforts in such awesome weather and simple lifestyle. 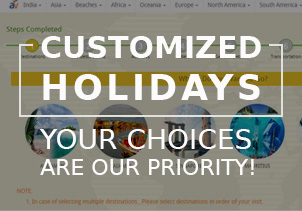 Your dreams, wishlist and passion about travel helps to connect you with the different corners of this universe. Try to immerse your soul with your physical presence at new place to fully discover it. In the same context, if you want to get away from home to enjoy unique adrenaline kicks, then the amazing world of New Zealand awaits for you. 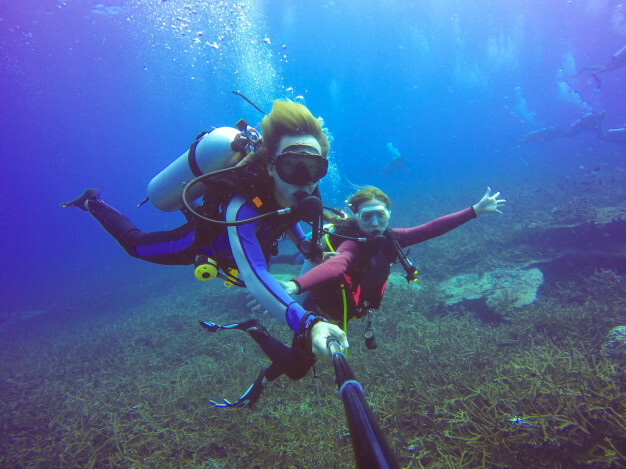 With the beauty of nature, it is a place which offers you the opportunity to adventure after adventure from a road trip to skydiving, hiking, swimming with dolphins, kayaking up to the limitless options. The place offers you a complete excitement for your pure happiness. 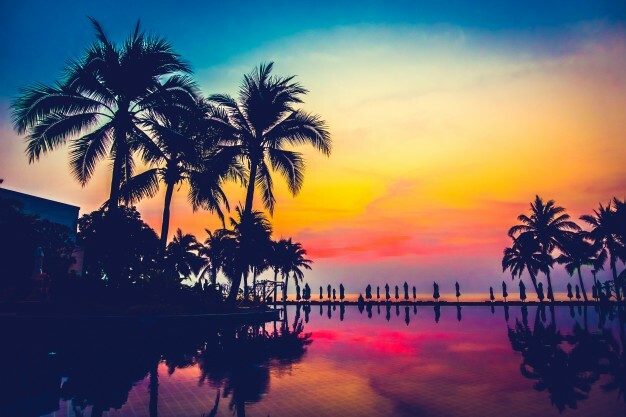 It will definitely a self-finding tour for you within the perfect backdrop of the gorgeous attractions and you'll want to come back again and again. With the run-down of unique collection of such life-inspiring places, we reach at a special platform with the name India which is good for soul-searchers. In the spiritual heart of India, you can learn Ayurveda, Yoga, meditation and all the wellness retreats for your inner as well as outer strength, peace and glow of joy. With the simple and basic living, culture, traditional values, you feel easy against the challenging situations of life. India is a classic destination with the combination of picturesque options and a wide variety from North to South and East to West. It will a great chance to closely view the beauty of nature, cooperation of warm-hearted people, logical connections between their traditions and routine life, colorful festivals, value of relations, exciting ceremonies, traditional dress-up and much more. On this pristine land, you can find yourself and even able to give the answers to your questions about the real means of life. Try to dive into a new world of African popular wildlife with your ranger like role. If you are a thrill-seeker by nature and want to explore world's popular African jungles then get ready to learn more about the big animals and their body language. 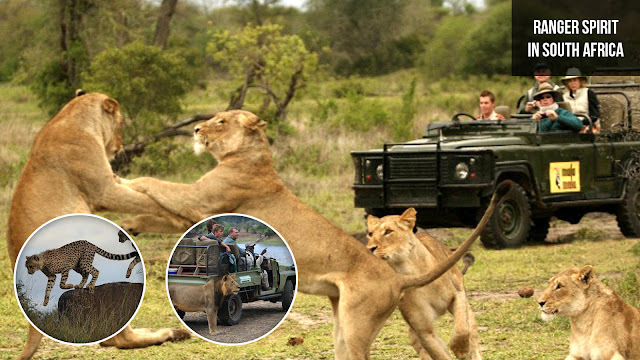 You can easily track them and get a closer view of elephants, rhinos, lions, giraffes and other big animals. Relish your days within campfire, tree-houses stay, wildlife photography and related extraordinary options. It is a great way to push your boundaries and enjoy jungle walks and safaris. Within such closer view of nature, you can able to get a lot of insight into yourself too. The exciting thought of such core factors related to facing the wild animals, taste of fire food, resting in tents, roaring of lions, gazes into the starry sky and just a movie like flashback discussion with your friends provide you an amazing soul-searching moment. Definitely, it will be the period when you want to lose yourself. Nature is fully loaded with such kind of inspiring destinations with just a gap of our decision and initial step. 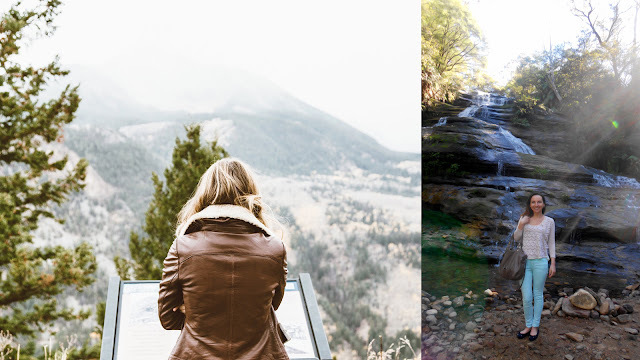 This kind of trips help to know yourself better. You can easily plan your future and set your goals. Just try it! For the sake of your entire life set out to find yourself. 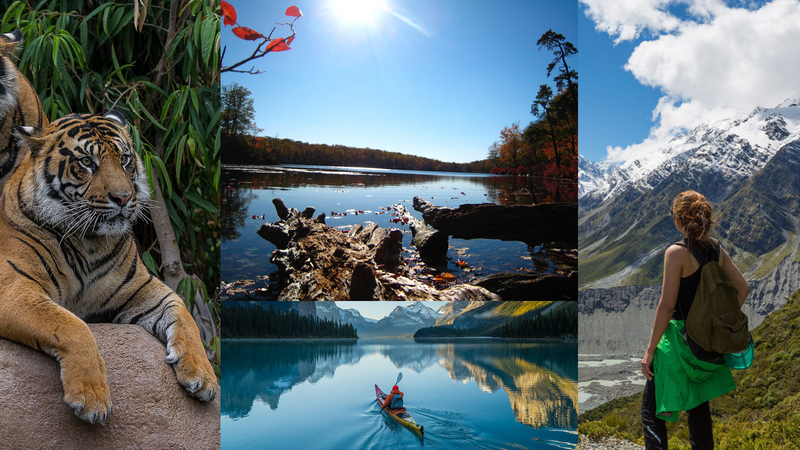 Are you looking to add some thrilling or adventurous journey in your travel diary? Then why not try hiking on most scenic and awe-inspiring glaciers of our planet. Here are a couple of the renowned icy masses of the world that you can browse. If you have curiosity and excitement for such kind of thrills in the midst of nature's spectacular sceneries, then we have a bit of something for you. Pick your selection from these top ice covered climbing attractions around the world and experience an ultimate adventure while strolling on ice. Glaciers are most astounding marvels of Earth with their sudden changing property of calmness from one point to ruthless at another. For a large number of years, these icy masses have been forming and softening, and have made a portion of the finest places on Earth. Apart from such unpredictable results, people still loving to cover or enter in the world of such magnificent glowing white ice sheets. Such long ice stretches within milky white backdrop and serene air is for sure offered captivating and enchanting experience. Why are you still tightly sitting? Set out on a snowmass to uniquely experience the beauty of ice world. Glaciers far and wide pull in a ton of vacationers consistently and caught the fantasy of adventure lovers in a wide range. 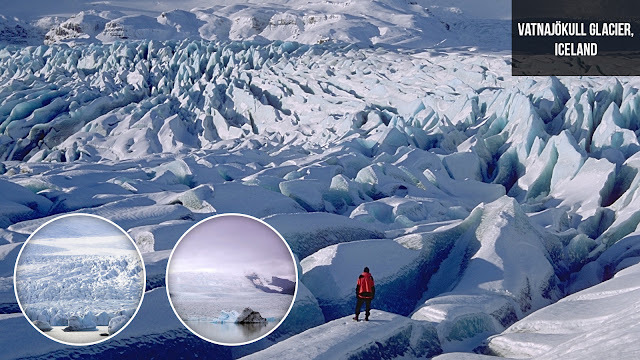 If you are one of them and your attention consistently drawn towards such huge ice covered land masses, then we have planned this brief rundown for you with the details of most famous glaciers around the world. 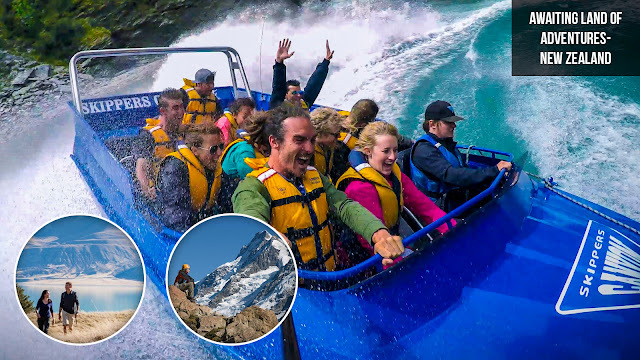 Are you a big fan of Lake Louise beauty, then you have ideal instruction to head towards South to Jasper to visit most popular glacier of North America. It is a wonderful Glacier covered up inside the rough scene of the world renowned Canadian Rockies. This icy mass spreads crosswise over Jasper National Park extending into the Icefields Parkway. This 6 Km long glacier covers an area of around 2.3 sq miles. It is located within the close proximity of Icefields Parkway, between the scenic locations of Banff and Jasper. Setting out to this icy mass in unequipped or unplanned manner is not prescribed. 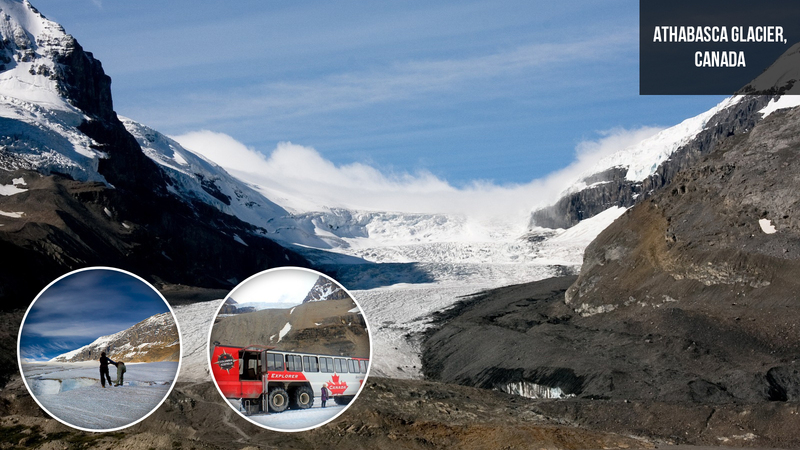 Athabasca Glacier is popular for a Ice Cubed Glacier adventure and for more thrilling act, one can explore its vastness. Icewalks are operational between May up to October. As a largest glacier of Swiss Alps, Aletsch Glacier is also declared as a UNESCO World Heritage Site. 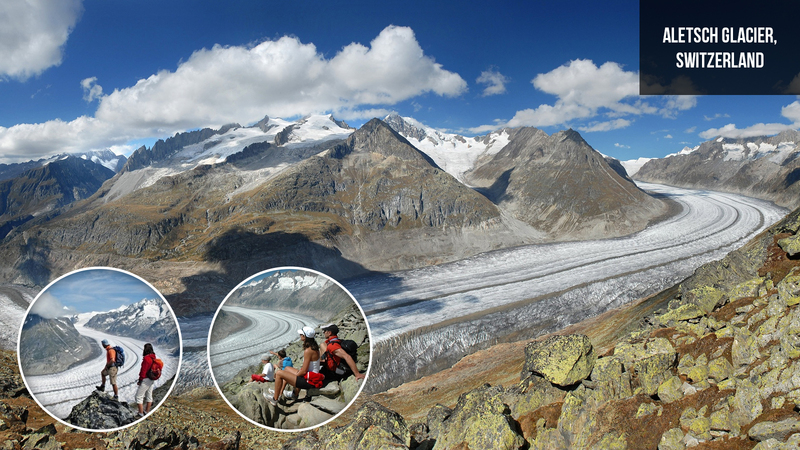 Covering within 120 sq km area, it is a part of Jungfrau-Aletsch Protected region. 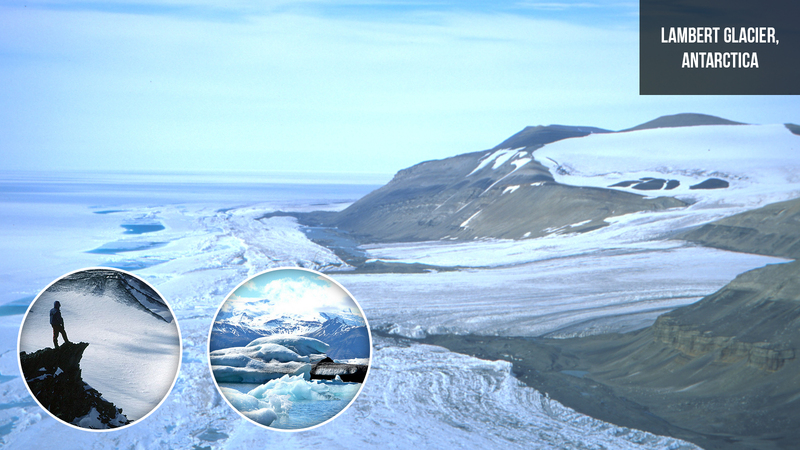 It is a group of three glaciers which meet each other at Concordia. From this point, the Aletsch proceeds towards the Rhone Valley up to Massa River. One can start his guided hike from Bettmerhorn and closely witness this rewarding area portrayed by 32 snow-clad pinnacles, each 4,000 m tall, offering a mind blowing perspective of the pristine Märjelen lakes. 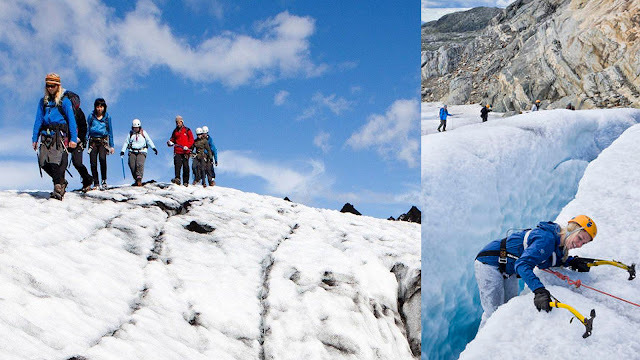 Without any prior experience or expertise one can enjoy this glacier hike from July to October. 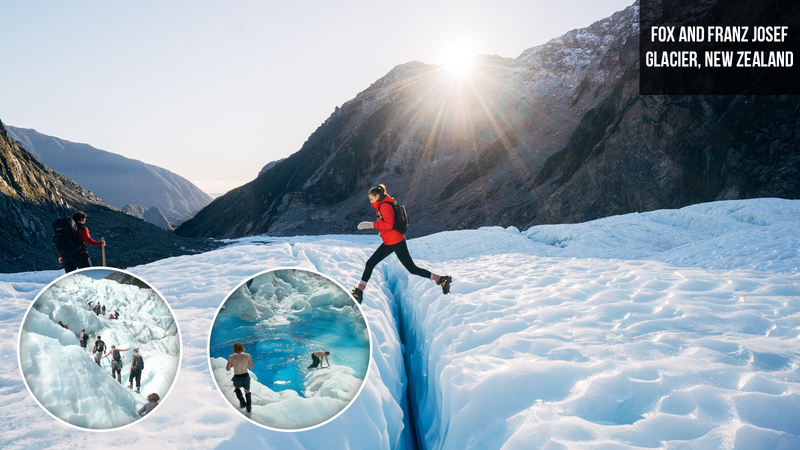 Feel internally satisfied with your ice walk performance on one of the most popular and fascinating regions of New Zealand's south island. 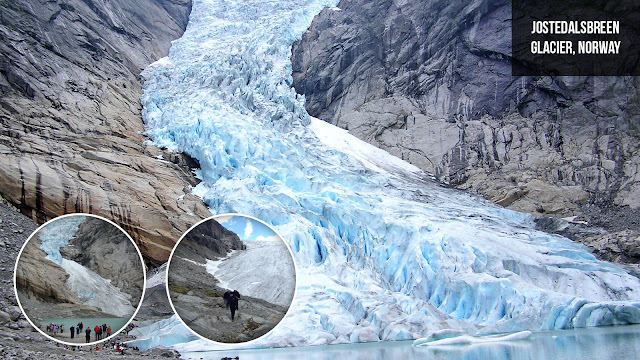 This famous couple of glaciers (Fox and Franz) found on the South island region of New Zealand within the surroundings of Te Wahipounamu World Heritage Site. The Franz Josef is a 12 km (7.5 mi) long and the Fox Glacier is a 13 km long glacier on the West Coast of New Zealand's South Island. Both settled at very interesting location towards a green temperate rainforest. While covering such scenic valley, you can also get the chance to enjoy your walk up to the silver-white Waiho River and stunning Trident Falls. 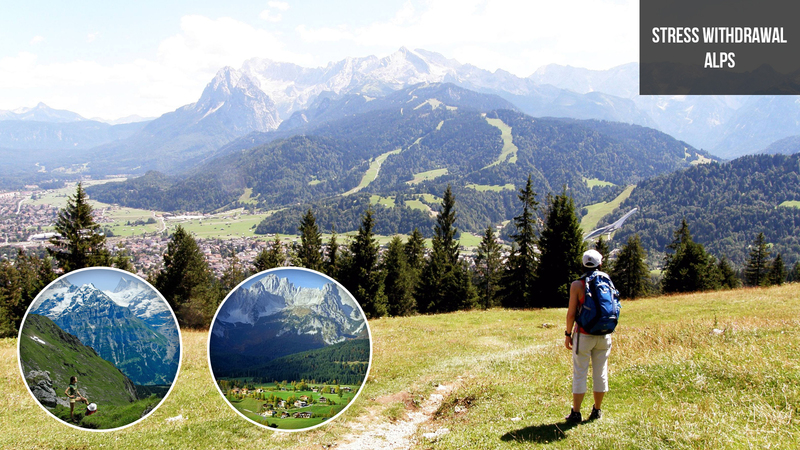 Enjoy your professional guided hiking along a pair of crampons within a wide area of 487 sq km. This 80 km long Jostedalsbreen Glacier is renowned in the category of the largest glaciers of mainland Europe. With more than 50 branches, it offers several hiking trails for thrill seekers. As a part of Jostedalsbreen National Park, glacier covers almost 50% area of the park. You can also combine your hiking trip with the discovery of this National Park. The glacier faces a high rising temperature with changing environmental conditions and results high melting rate. But, the rate of snowfall maintains the balance and still holds the significant amount of ice. The best time of hiking is from May to October. Now, the time comes to add the world’s largest glacier into the list on the land of Antarctica which is already a home of several spectacular glaciers. Lambert is one of the most popular glaciers of the Earth. For an adventure seekers, it will be a long journey in isolated region of Antarctica. This 60 miles wide and 320 miles long ice mass considered as one of the most important among the study of climate and its changing factors. At longitude of 70 degrees, Lambert drains into Amery Ice Shelf which comprises of rarely found icebergs. It will become more excited to know a maximum of two tourist ships sail to the place in a year. Within an area of 250 sq km, this 30 km long glacier forms the Southern Patagonian Ice Field. 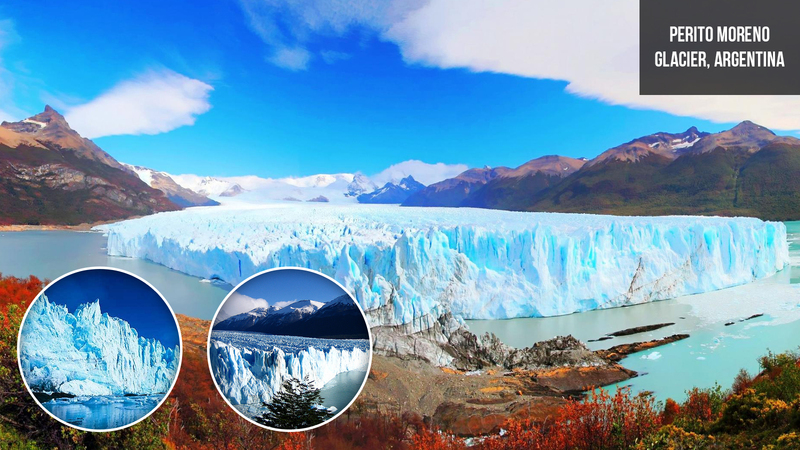 It is located in Los Glaciares National Park in southwest Santa Cruz province of Argentina. This major tourist attraction of Argentina is named on its first discoverer ‘Francisco Moreno’. 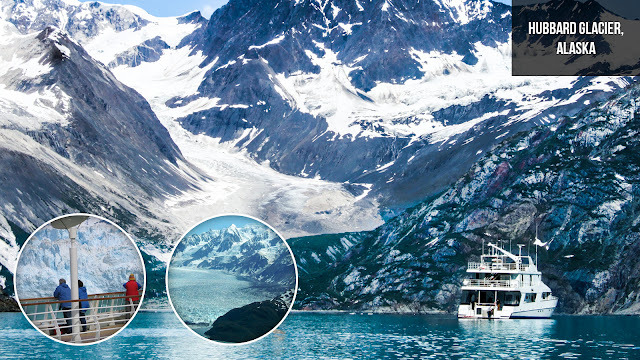 As, most of the glaciers of the world are situated in the region of Antarctica and Patagonia. Similarly, Perito Moreno is one of the three Patagonian glaciers which is under a major topic of discussion or research among glaciologists due to its expandation. You can deeply explore it during a trekking or hiking tour. If a country itself has a word ice in its name, then it clearly signifies the cool climatic conditions of the place. Similarly, Vatnajokull surprises you with its huge massive area of 8100 sq km. It covers within around 10% area of the island and which results its calculation among largest glaciers of Europe. 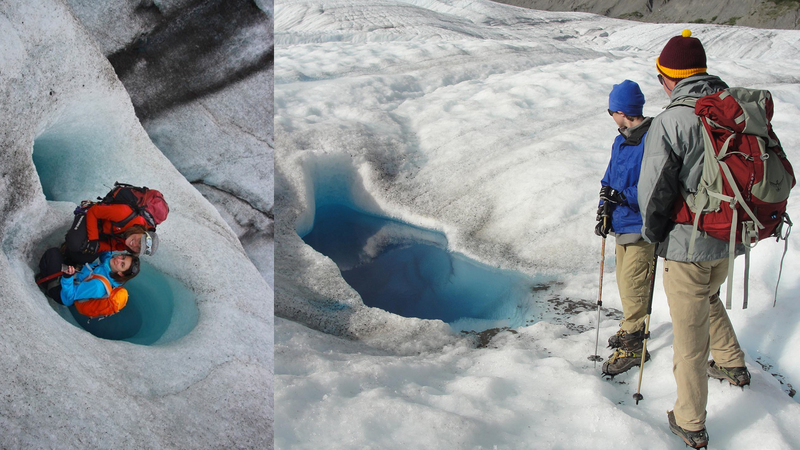 With the formation of largest ice cap, this glacier also underneath several active volcanoes (Grimsvotn is one of them). One can also witness the huge amount of icebergs in its glacier lake ‘Jokulsarlon’. It is most voluminous glacier of Iceland, which truly gives an incredible view. Hubbard Glacier is one of the fast expanding glaciers of North America. It is situated in Yukon territory of Canada in the eastern region of Alaska. 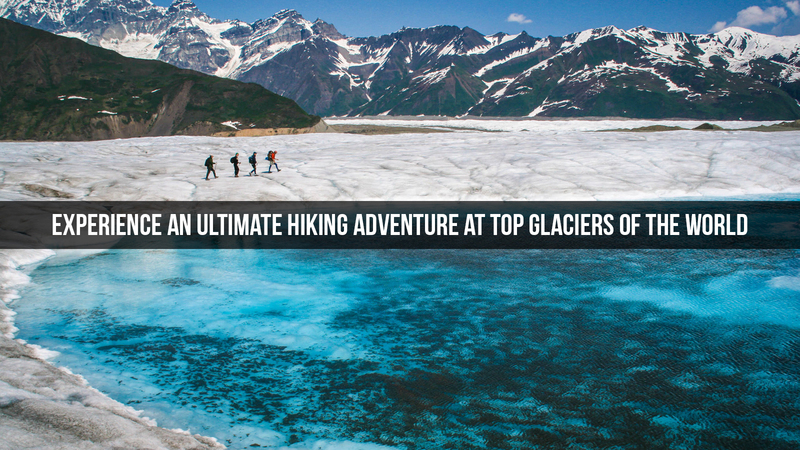 It is also popular as a largest tidewater glacier of North America continent. Hubbard Glacier provides a stunning look with its around 122 km long stretching area. According to researchers, one can also witness around 400 years old ice at its foot. Due to its constantly calving off massive icebergs, hiking is not allowed here. Tourists can take a helicopter tour (with special permission) to cover its captivating views. 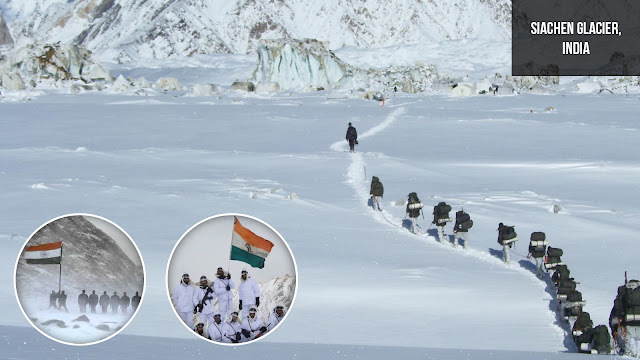 Siachen Glacier is located in the extreme northern region near the Indo-Tibet border. It lies at high altitude of 5,400 m within the Karakoram ranges. With its approximate 76 km long length, it is considered as second longest glacier of the world outside the polar regions. Within 270 sq miles area, it is located on Line of Control between India and Pakistan. This vast snow field provides a good mountaineering opportunity, especially who love challenges. At this amazing height, you can also try ice skating, skiing and heli skiing like activities. Annoyed or irritated by an unrewarding schedule? Want to escape and discover shelter at some new place, then try to reinvent yourself in tranquil and peaceful surroundings. There are numerous serene places in India, which attracts individuals with such longings, fulfill them completely and let them return engaged with new strength. However, there is definitely no deficiency of the most serene spots to visit in India, pick one from the given arrangement to begin with. You may make the desire to confine from the world with your life partner and invest some encouraging time by welcoming each other. Inspired from a huge honeycomb like architecture, Ki (or Key) Monastery in the heavenly Spiti Valley of Himachal Pradesh absorbs most extreme quietness. This 1000-year old Buddhist center, oversees pristine River Spiti from a peak and is honored with gorgeous sceneries of the snow-capped Himalayas. Safe from the grasp of the modern world, the place is perfect for meditation or to just unwind looking at the nature's greatness. 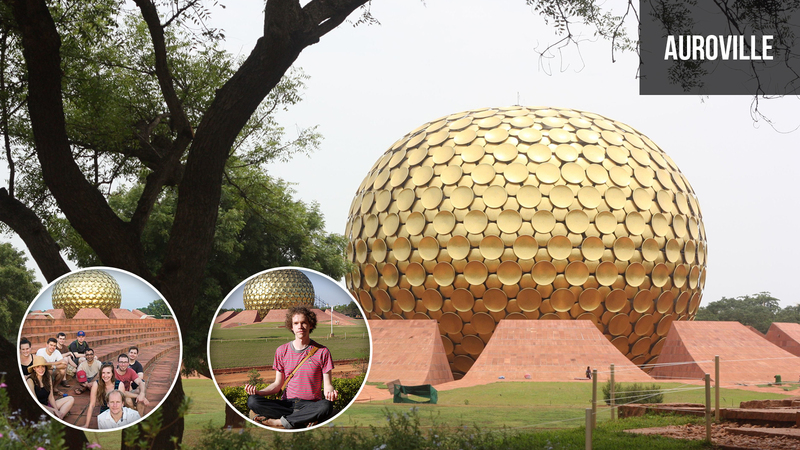 Well known as the 'City of Dawn', Auroville is a profound center occupied by individuals from more than 40 nations. 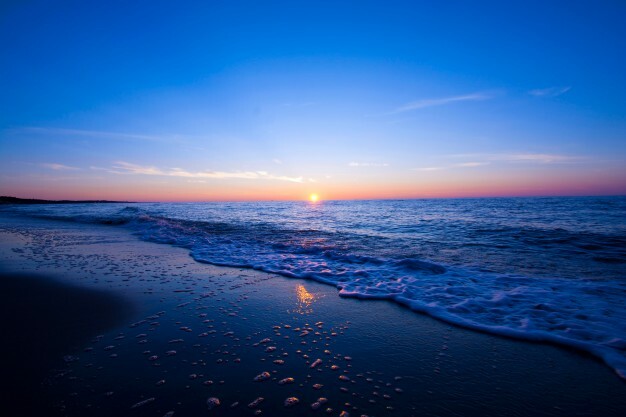 Situated close to the Union Territory of Pondicherry (or Puducherry), the place achieves greatness as one of the best quiet places in India to try different things with your inner strength and awareness. Enjoy the real means of peace and participate in meditation at Matrimandir, a brilliant golden colored metallic sphere with carefully manicured yards all around, procure peace at the Green Belt range and enjoy a lot of healing option and ecological undertakings. With untainted common excellence, the cantonment town of Lansdowne in Uttaranchal appreciates stunning quietness, broken just by the tweeting of fascinating avifauna. 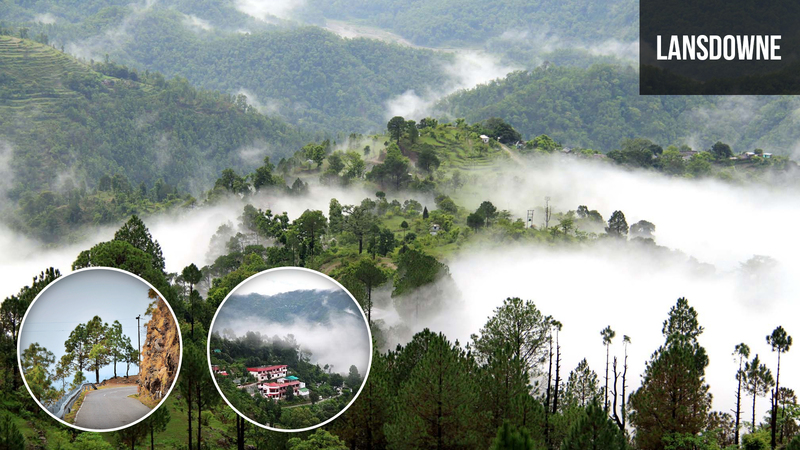 Covered with the colonial structures, holy places and admiring beauty of oak and pine canopies, Lansdowne is ideal for meditating in the laps of nature and also for less crowded romantic visit. By Road- Two routes connect the town with New Delhi, one via NH 119 and NH 58. 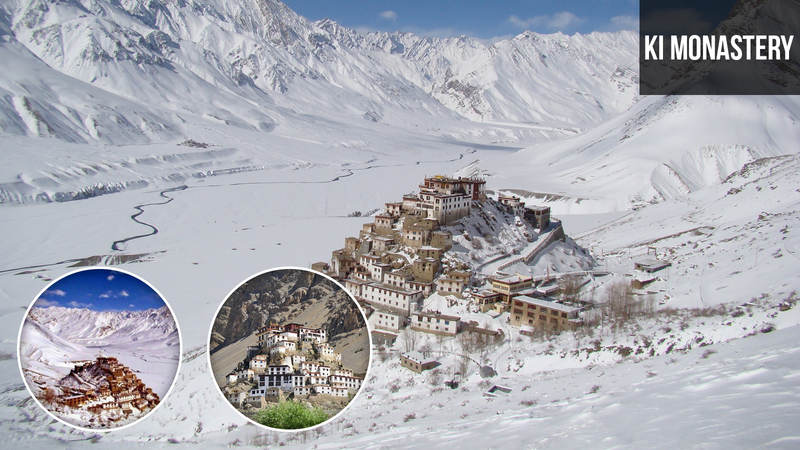 Finding a tranquil place in India is not troublesome when you are in Ladakh. 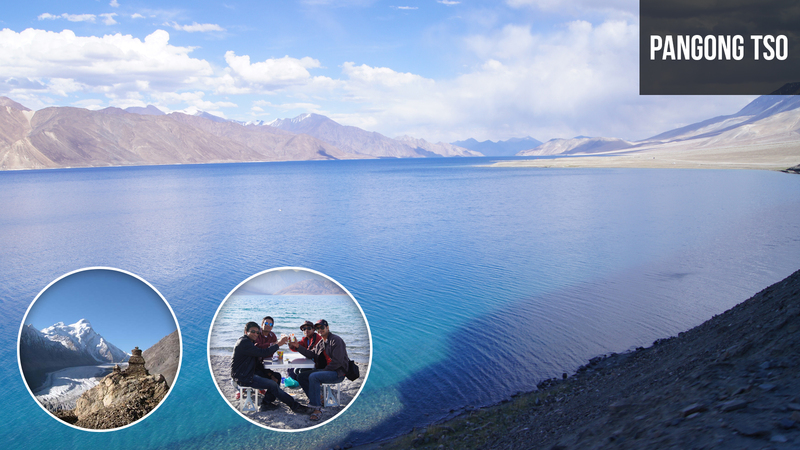 One such place with the astonishing view is called Pangong Tso (Pangong Lake), a high-altitude lake parading various shades of blue and getting a charge out of the tremendous view of tough mountains. Invest quality time undisturbed by the outside world, appreciate wonderful dawns and nightfalls and go with uncommon to-discover creatures and migratory birds going by the lake. While you appreciate the captivating Dhauladhar Range with one eye and the sprawling Kangra Valley with the other, you might capture the gracious rainbow colors from here. You definitely soak in this overwhelming placidness. 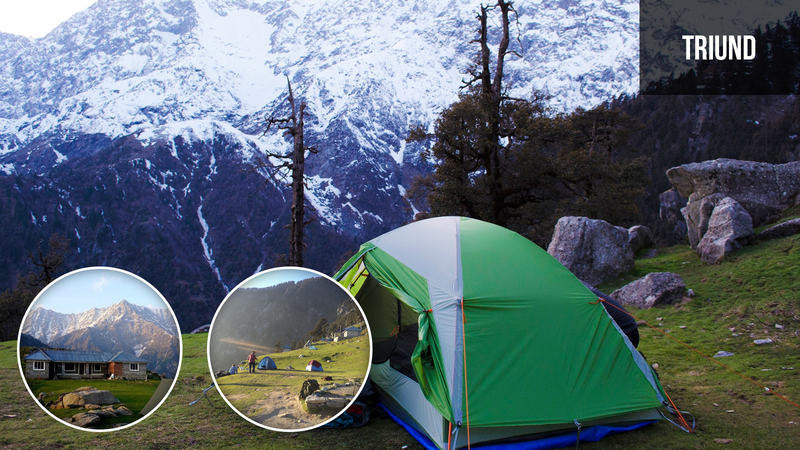 This is the thing that you feel from Triund and subsequently trekking through the awe-inspiring territories of rhododendrons, oaks and deodars. It's not only the name which recommends its addition in the main rundown of serene places in India. The Silent Valley National Park is really a noise-free place with melodies touch of nature. As a part of the Western Ghats, this National Park hosts an abundance of mountain rainforests and is home of variety of birds species and animals along with the speciality of lion-tailed macaque and Malabar Giant Squirrel. 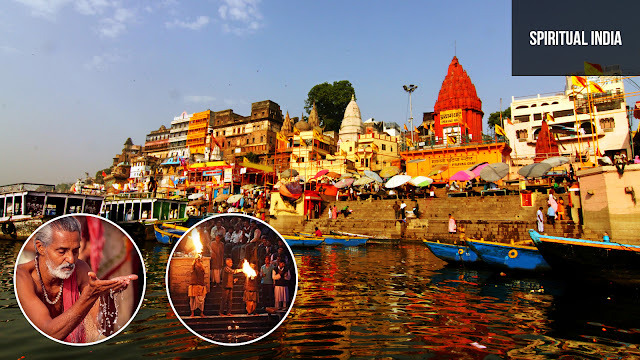 Is it true that you are a traveler looking for serene spots for excursion in India? 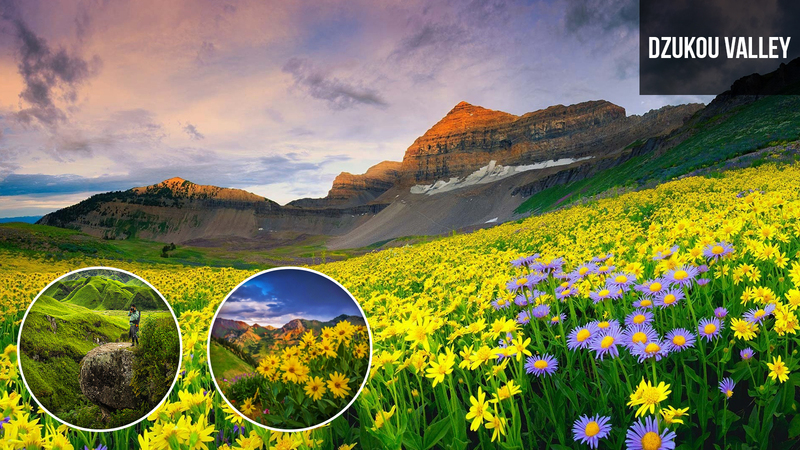 Then have a look over the Dzukou Valley, or the Valley of Flowers in Northeast India, which wears rich green grassland and flower bed of fascinating blossoms with an unending smoothness. Situated on the fringe of Nagaland and Manipur, the valley unfurls novel amazements like chirpy streams and hollows at each progression of the 15-17 km long trekking courses. Through flight or train firstly reach Dimapur and then board a bus to Kohima. 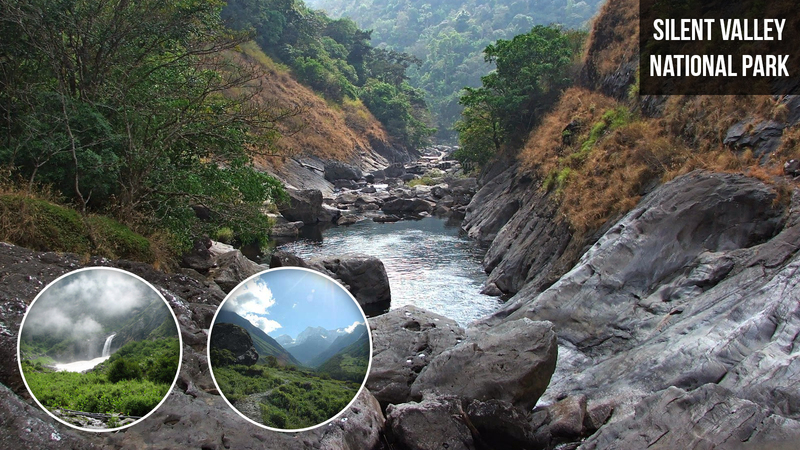 After that, cover a trek from Kohima to Viswema (about 23 km) or Zakhama (about 16 km) to reach Dzukou Valley. 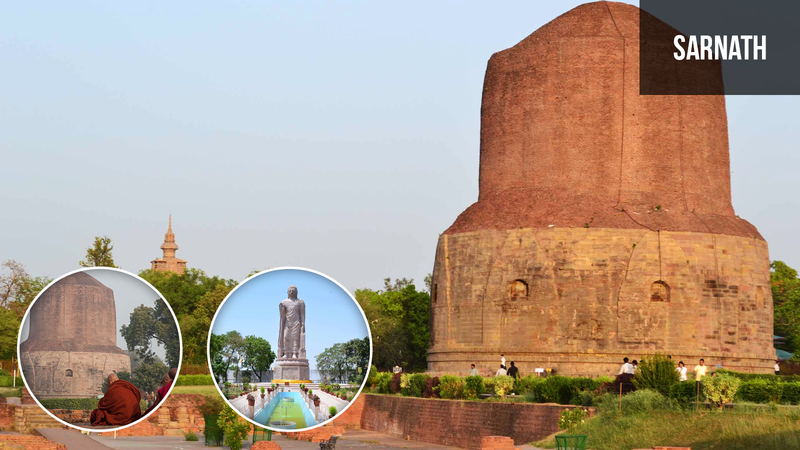 Sarnath is a place where Lord Buddha preached his first religious lecture. So, it is among one of the main quiet and calm places in India. Sarnath is close to the holiest Hindu city Varanasi in the midst of a green backdrop. The place has unique relax in its tranquil atmosphere. Try to reach deeply inside the serenity of the place with the visit at Buddhist stupas, viharas, Ashoka Pillar and related artefacts. In the state of Assam, Majuli is the world’s largest river island. Within the scenic spectacle, it is flanked by the water flow of Brahmaputra on both sides. 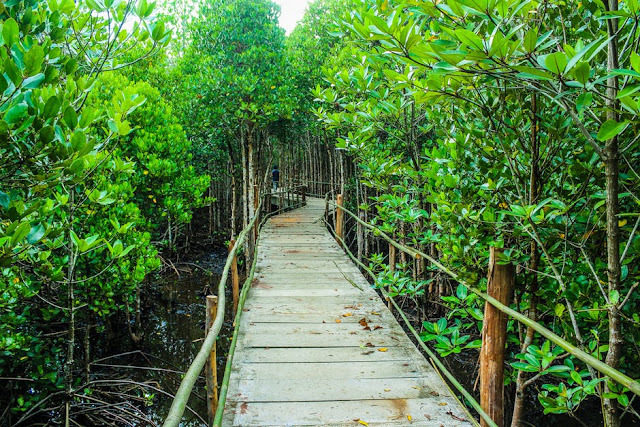 While exploring rich countryside, the place offers beautiful monasteries, rice fields, cultural centers, magnificent display of avifauna and charming scenes of the rising sun. Go gaga for the verdant greenery spread all over and make whisper exchanges with the nature. Firstly, reach Guwahati by road or plane, then cover a distance up to Neamati Ghat (16 km) via bus or taxi from where you can reach through ferry ride. 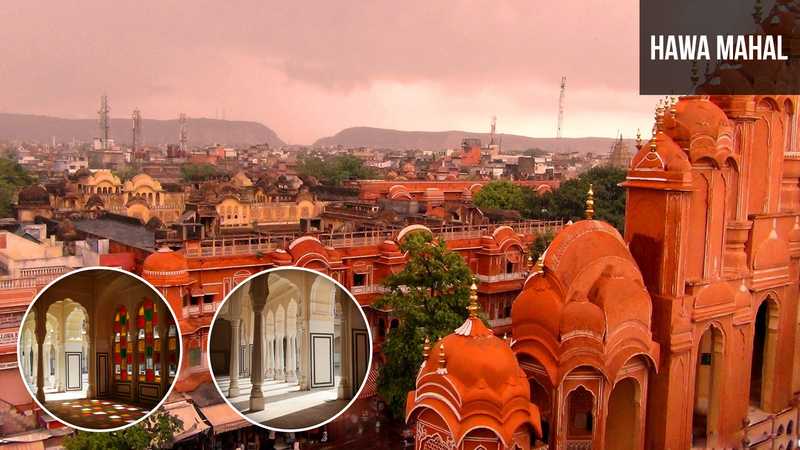 Witness the beauty of Indian art, culture and architectural strength at the 'Royal Land of Kings- Rajasthan’. 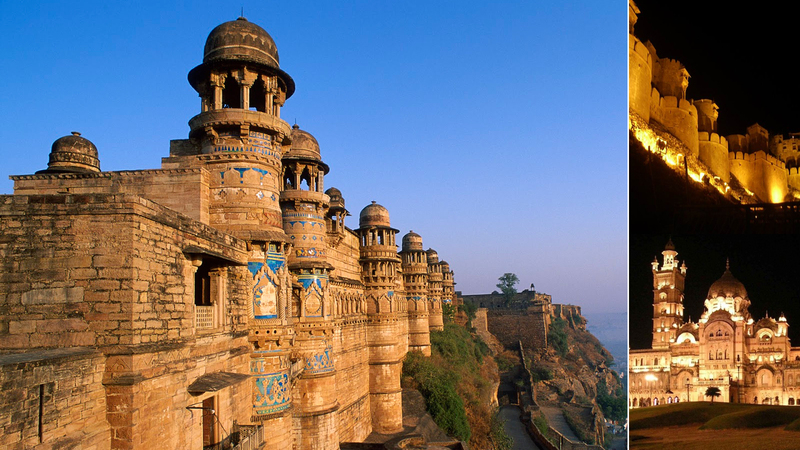 This largest Indian state has a great collection to offer a mesmerizing view of history. With the number of grand historical places, one can enhance his knowledge and information about rich culture and heritage of India. To cover the beauty of such architectural marvels from hidden doors of history, there is need of a range of discovery about different regions with their unique specialities. This royal majestic North Indian state has its own unique glory. 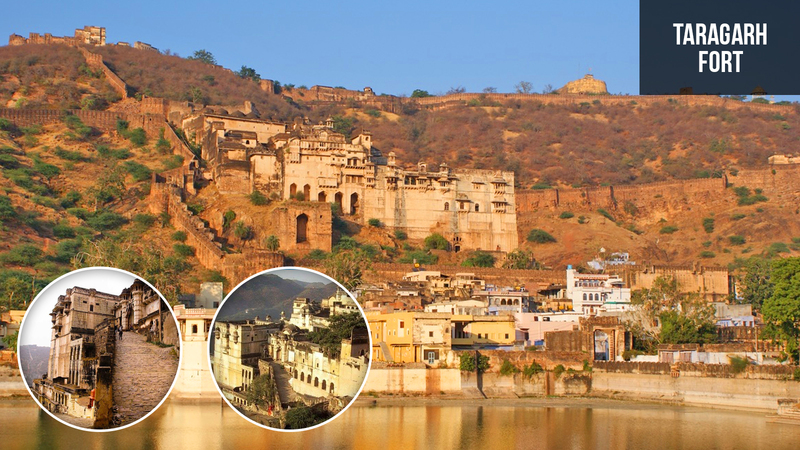 One can catch the illustrious view of Forts and Palaces of Rajasthan with their impressive historical records. This spectacular desert land has fabulous collection, ranges from the ruling era of different Maharajas or Kings. These regal structures and astonishing creative work have a basic motto of protection. One can easily cover this tourist friendly area to collect a wide range of majestic colors. This wonderful rich heritage within a splendid frame of artistic beauty always ready to greet a guest with grand welcome. 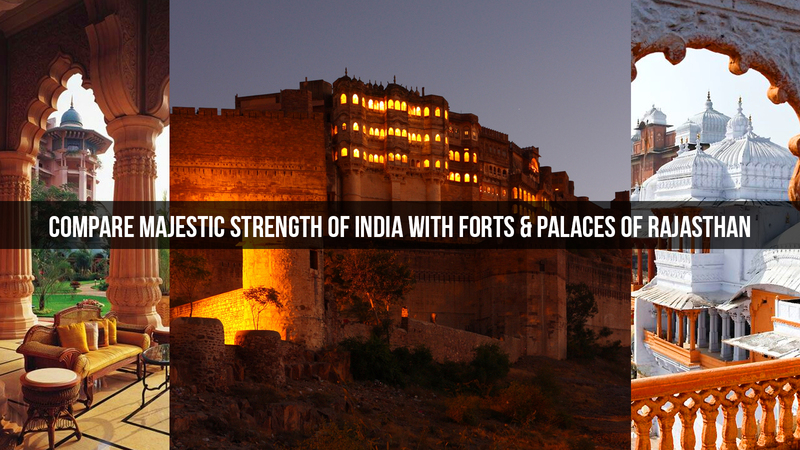 Try to cover the beautiful set up of rich traditions within the old allure of royal forts and palaces. 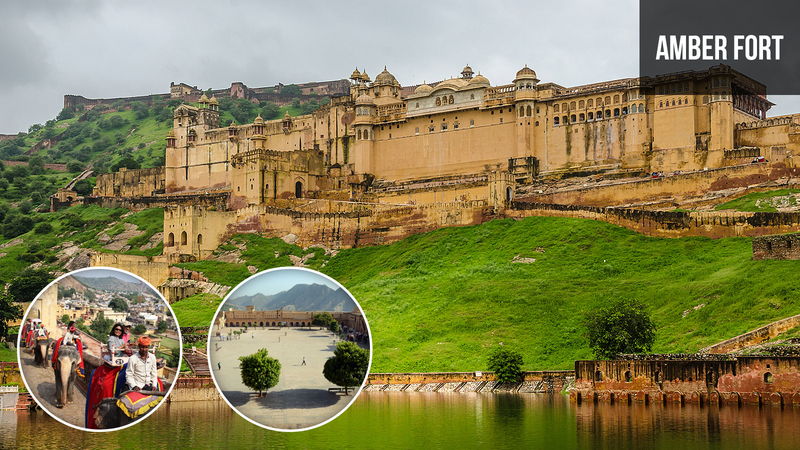 These hotels, palaces and forts collectively offers a great view of magical India along with a clear image of its imperial past. One can try the taste of this royal ambience with his stay in such royal residences. As, few of royal residences turned into heritage hotels for a better living experience and also helpful to promote better tourism opportunities in the region. Cover surprising architectural charm of sprawling complex of Amber Fort with your visit at Jaipur. 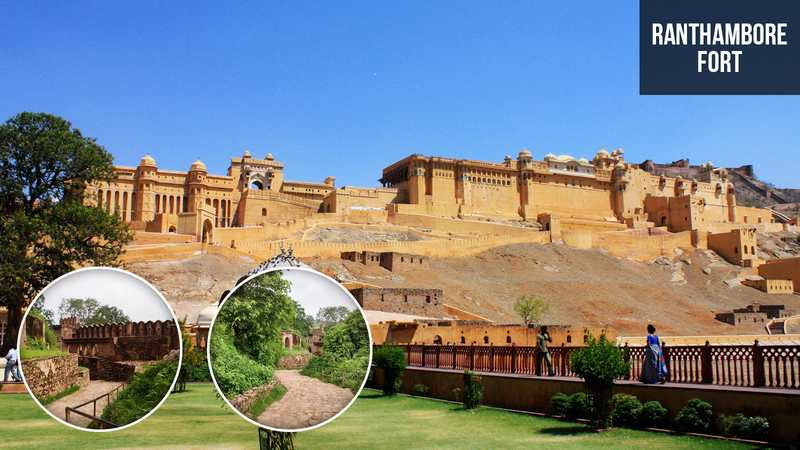 This fort is situated in Amber town, 11 kms apart from capital city Jaipur. This 16th century grand palace is listed among one of the popular forts of Rajasthan. Its construction began in 1592 by Raja Man Singh and completed by Sawai Jai Singh. The wonderful layout of this building has the ability to grab visitor’s attention. It is partitioned into four different sections with a main opening of Sun Gate. The palace has a group of popular attractions such as- Sheesh Mahal, Sukh Mahal, Diwan-i-Aam and related areas with their intricate work of fresco carving. With such fascinating artwork, the place provides a great combination of Mughal and Hindu elements. Hawa Mahal or 'Palace of Winds' is one of the prominent attractions of the scenic Jaipur city. 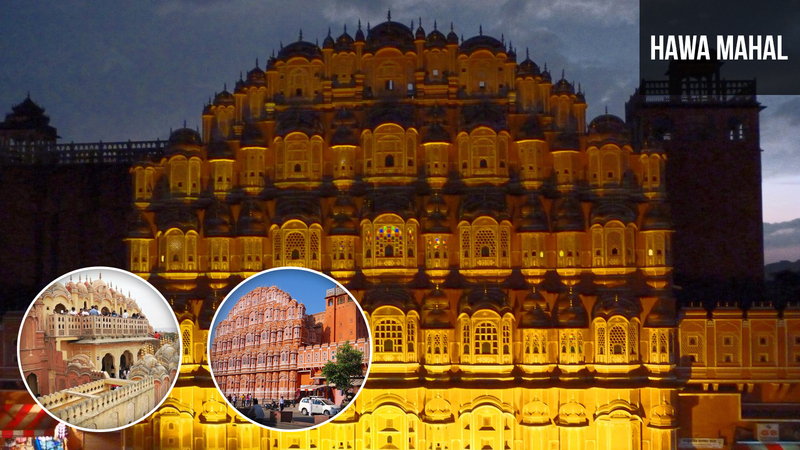 In the central location of Jaipur, this astonishing structure was built by Maharaja Sawai Pratap in 1799. 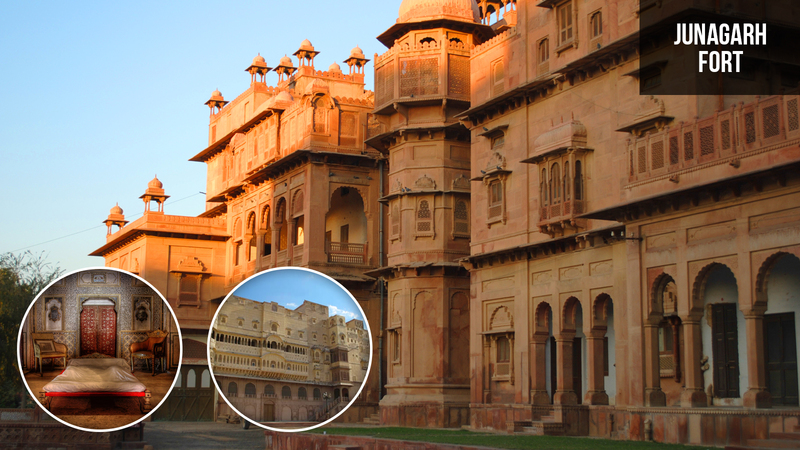 This five-storey palace within red and pink sandstone construction attracts every tourist attention. The palace is also popular among its stunning interior setup related to latticework, domed canopies, floral patterns, marble work and fluted pillars. This Rajputana architecture in pyramid shape has comparison with the crown of Lord Krishna. The prime source of attention of this wind palace is its 953 windows with their intricate design. This beehive shaped castle has logical facts behind its construction related to free circulation of air, spacious courtyard, excellent slopes, passages and proper area for clear view of the entire city. 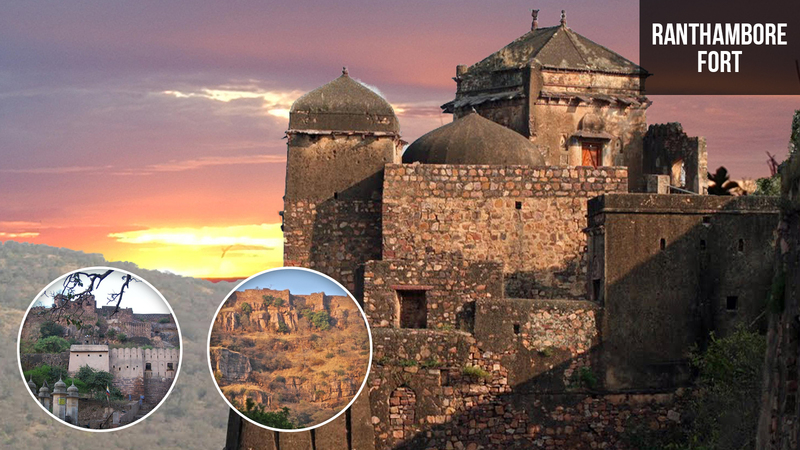 Ranthambore Fort is a great example of one of the oldest settlements in the area of Sawai Madhopur. Within the green setup of Ranthambore National Park, it is an extraordinary construction from 8th century back. The fort has a vast historic record related to enemies attack over it. As a tourist, you've to spend your good amount of time to explore fort, hill area and the surrounding National Park. For a history lover, it is a better place to collect an interesting record of data relevant to the past of the place. It is a place which caters a long-list of interests related to historic charm, wildlife adventure, religious attractions and overall breathtaking charm of the place. It is a perfect site for weekend getaway within the company of family or friends. Junagarh Fort is a welcome attraction in the princely city of Bikaner, Rajasthan. Basically, forts have a major concept of safety-guard behind its construction. Similarly, Junagarh Fort by Raja Rai Singh is one of the great examples of Rajput, Mughal and Gujarati architecture to provide protection to palaces, shrines and pavilions of the area. Currently, the fort, palaces and temples are preserved as museums to convey rich past to further generations. This magnificent red sandstone building has several attractive charms to catch the attention of tourist with its delicate stone work, minarets, statues and paintings. 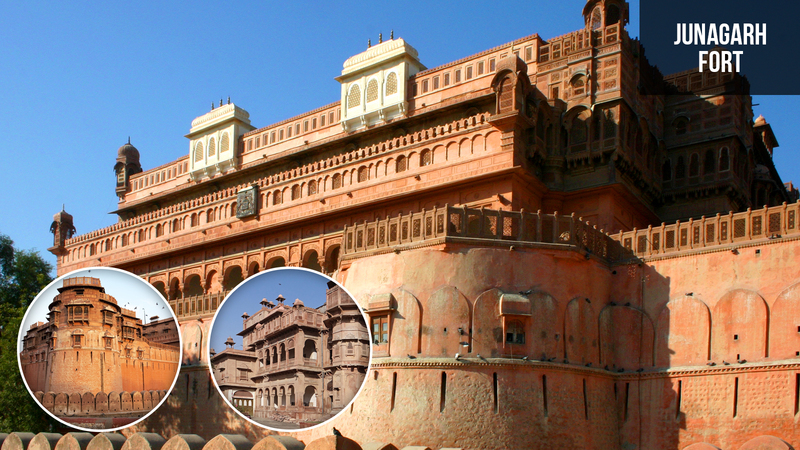 The entire fort complex was built during the period of Raja Rai Singh, the sixth ruler of Bikaner. This hilltop fort provides a unique illustration about the past records of history, a combinational work of different architectural styles and culture of the place. Jaisalmer Fort is considered among one of the world's largest forts on the scenic land of Thar Desert. The Fort proudly stands on Trikuta Hill at an elevation of 100 meters within the heart location of Jaisalmer city, Rajasthan. 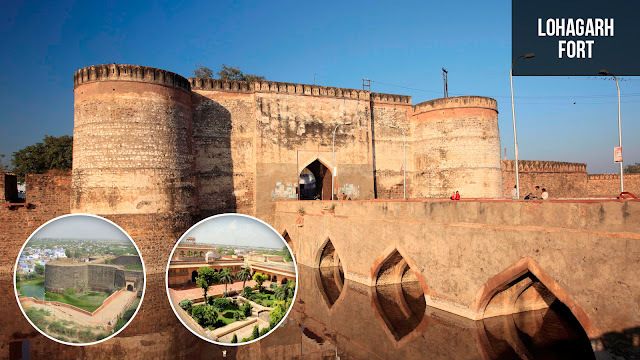 The construction of fort belongs to 1156 AD (by Rajput ruler 'Rawal Jaisal') and it has several interesting historical records related to many battles. This breathtaking monument is locally popular with the name of 'Sonar Quila' or 'Golden Fort' due to its massive sandstone walls in yellow color. If you really witness its striking charm, then capture its honey-gold shades during sunset. 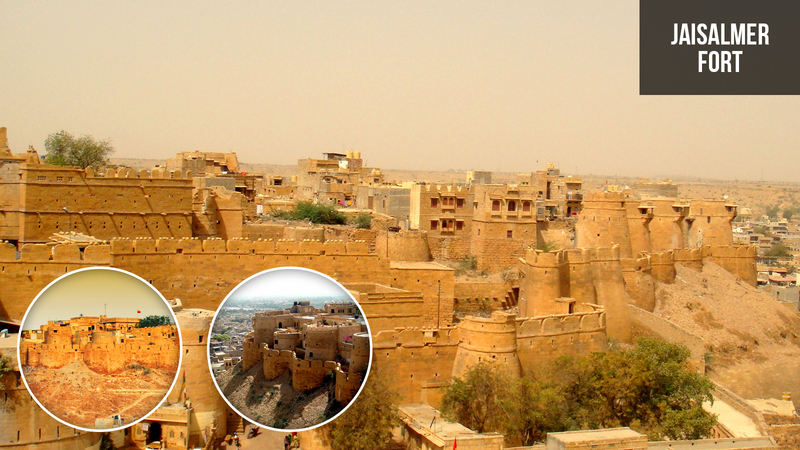 Jaisalmer Fort also provides an amazing view with the rising rays of the sun and reflects a golden flame like luster. 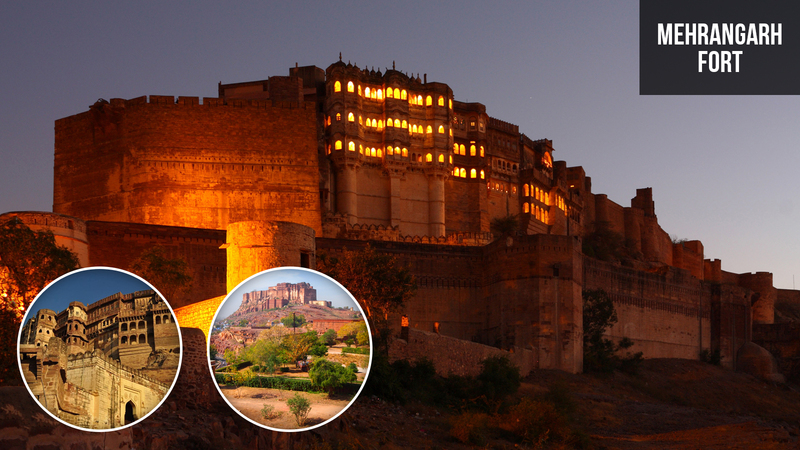 The fort of Mehrangarh is considered among one of the majestic architectures of India. 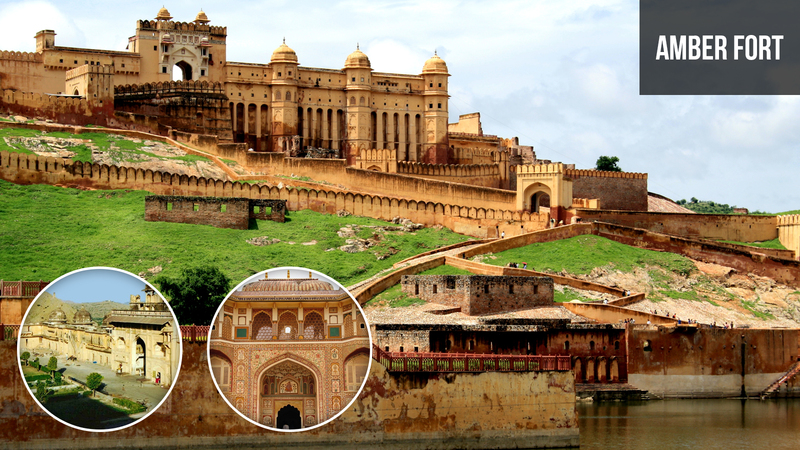 This vast construction was built by Rajput ruler Maharaja Rao Jodha Singh in 1459. 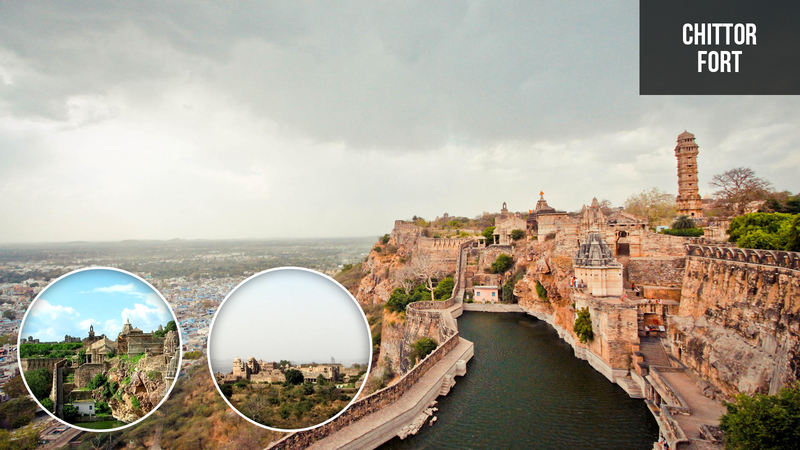 This prime tourist attraction is situated at an elevation of 150 m, around 5 km apart from Jodhpur city. The major in-house fascinations of Mehrangarh Fort are Pearl Palace (Moti Mahal), Phool Mahal, Rang Mahal, Chamunda Mataji Temple, Umaid Villas, Chandan Mahal, Mann Villas and Ajit Villas. Basically, the purpose behind this grand structure is to offer a secure locality. 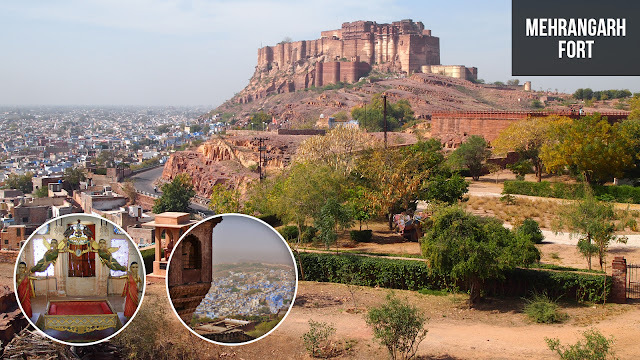 In the similar context, Rao Jodha decided to move his capital from Marwar to Jodhpur and results in the foundation of this great Rajputana fort and palace with its seven gates. To witness the past royal exhibition from the records of paintings, furniture, armory and related things, Mehrangarh Fort Museum is a better place which provides a closer touch of the past. Chittorgarh is a great place to memorize the sacrifices and heroism of Rajputs. Chittor Fort is a well renowned royal set up of 7th century AD by Mauryan rulers. With the several past evidences, the city still proudly stands with its historic battlements and monuments from medieval times. 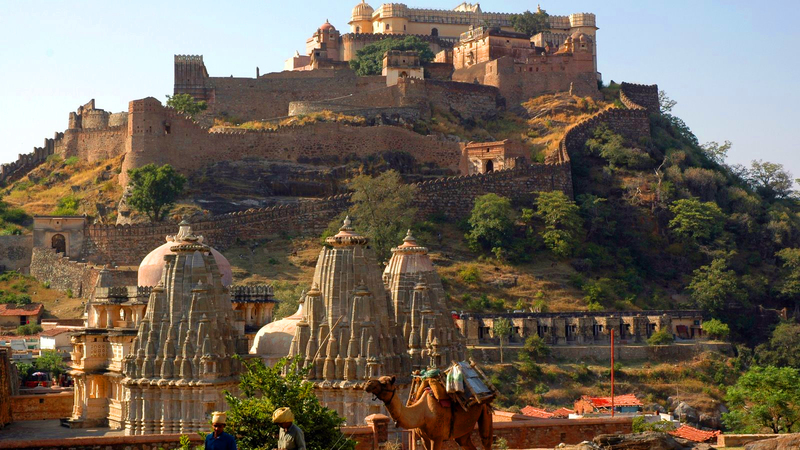 Chittor Fort is one of the largest Indian forts within the wide area of 700 acres. With the record of legacy of a glorious past, the 'Chittor Fort- a World Heritage Site' is bestever site in Chittorgarh town. 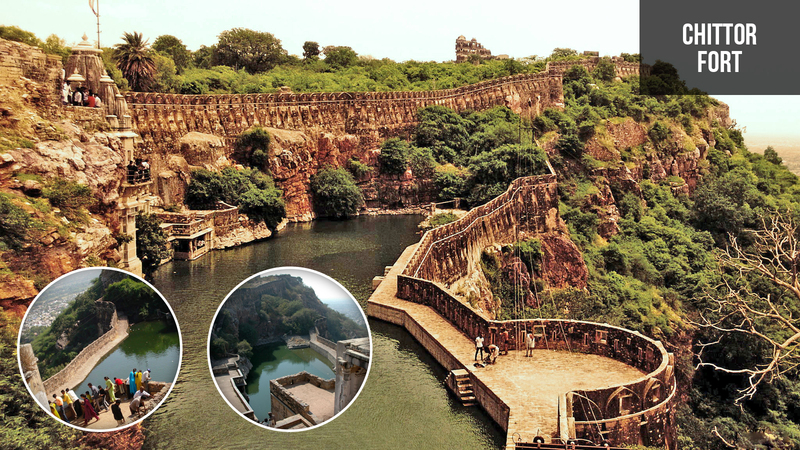 This colossal hilltop construction of 180 m over the hills of the Aravallis range depicts the pride, culture and values of Rajputs. It is also a popular region due to the capital of Gahlot and Sisodia kings between 8th to 16th century. This outstanding architecture is also famous for its 84 water bodies including step wells, ponds and wells. Don't miss out to cover the luxurious beauty of Rani Padmini Palace and Rana Kumbha Palace during a visit to Chittor Fort. Cover the heavenly beauty of Pichola Lake during a visit to Udaipur Lake Palace. 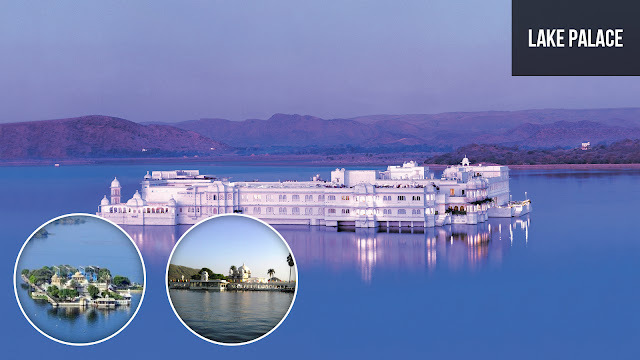 This ‘Lake Palace’ or ‘Jag Niwas’ was constructed under the direction of Maharaja Jagat Singh II, which was restored in a complete romantic setup in a form of Palace hotel during 1963. This luxury palace is considered among one of the most romantic hotels in the world. Truly, the stunning beauty of this palace, it’s pleasing ambiance and scenic backdrop offers a heavenly feel within a complete royal setup. 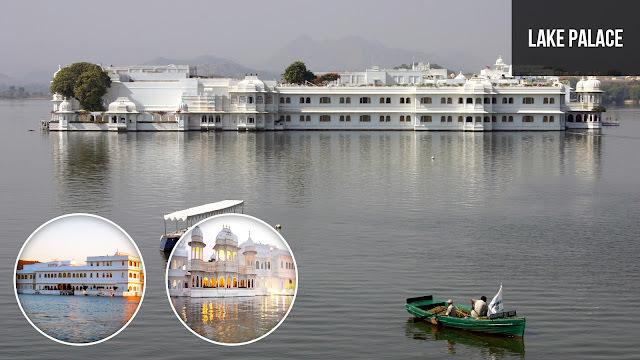 Lake Palace has 83 rooms with an eye-inspiring exterior coated in white marble. One can count its astonishing beauty with its terraces, fountains, gardens, courtyards and ornamented decor. Lohagarh Fort or 'Iron Fort' is a major contribution of Bharatpur Jat rulers for safety purpose against Britishers attack. It is also renowned as 'Pride of India' due to its strongest structure ever build in Indian history. With a focal point of Bharatpur, the fort has strong relation with past historical records. It was a well planned structure by the Jat ruler Maharaja Suraj Mal on an artificial island. The entire construction has a logical setup within the secure settings of deep moats. This wonderful build up of Iron Fort has a great architect inspiration from the ancient mud forts. However, this fort and its palaces are not popular among their ornamental decor, but their construction offers a well planned architectural strength based on the functional security. 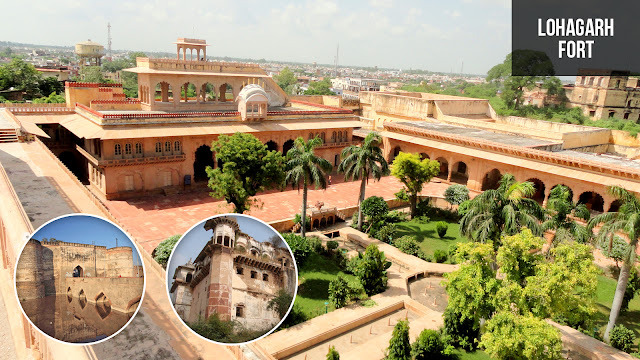 Inside this fort, Mahal Khas, Badan Singh Palace, Kamra Palace, Mahal Khas, Kishori Mahal, Moti Mahal, Kothi Khas, Fateh Burj and Jawhar Burj are major interesting constructions based on tourist interest. The beautiful town of Bundi is well popular due to its rich heritage. 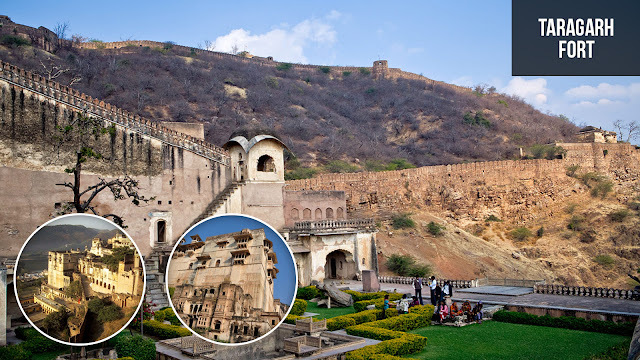 Taragarh Fort or 'Star Fort' is one the most impressive structures of Bundi City. It is an ancient sandstone construction of basalt rocks from the mid of 14th century by Hada Chauhans. The Bundi Palace complex is situated within the grand setup of surrounding water reservoirs, lakes and hills. This impressive structure stands on a steep hillside and offers the picturesque attractions from the record of ancient history. The place offers major attractive view in a form of Chandra Mahal, Chitrashala (picture gallery) and several remarkable artwork from 18th century back. The fort will definitely amaze a tourist with its excellent architectural work or rich diorama including crisscross tunnels, small palace, water reservoirs and nearby a tomb of Miran Saheb Ki Dargah.